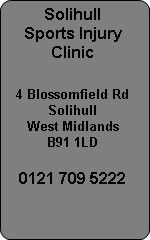 Solihull Sports Injury Clinic in the West Midlands have a Sports Podiatrist who specialises in running injuries and feet. Biomechanical assessment of your gait can be carried out on a treadmill with video gait analysis and a 3D laser foot scan will map the contours of your feet to ensure an accurate prescription for orthotics if required. Solihull Podiatrist and Chiropodist Peter Taylor works from the Atlas Sports Injury Clinic in Solihull West Midlands. Peter is responsible for fitting of prescription orthotics and the foot care of Solihull and Birmingham patients. Solihull Running Injury Clinic is based at the Atlas Sports Injury Clinic where we look after the needs of local runners and runners training for the Birmingham Half Marathon and the London Marathon. Running injuries are often caused by poor biomechanics when running extended distances and we can resolve these problems for you. Podiatry and Chiropody are one and the same but many podiatrist have no interest in sports injuries. We understand running and runners and will get you back training in the fastest possible time. 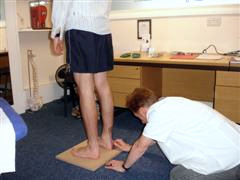 Our prescription orthotics are the best available and will be designed bespoke for your needs.